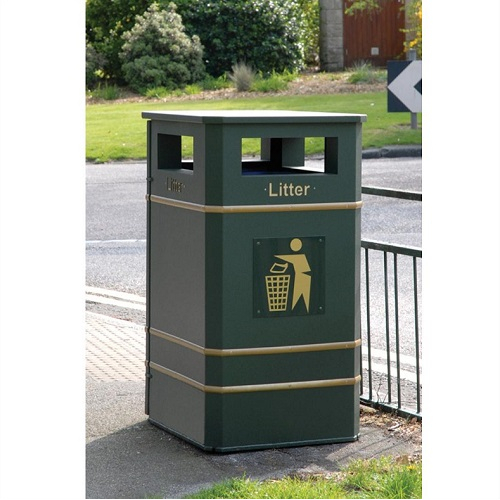 This steel wheelie bin container has been designed to securely house a 240 litre wheelie bin and offers an ideal solution to the problem of unsightly litter bins. It is manufactured from 2mm steel and features a heavy duty front opening door with slam lock mechanism. The unit has 'LITTER' laser cut beneath each aperture with a gold backing plate. 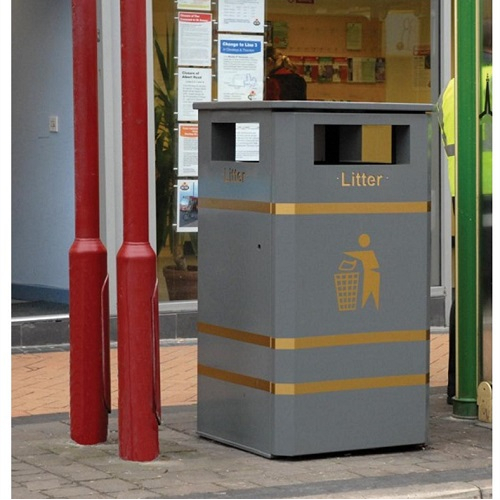 Four apertures give gull 360 degree access to the bin meaning it can be located in open places. Three gold vinyl tape bands are fitted as standard and also a vinyl Tidyman logo is fitted to two sides. Pyramid top - The pyramid top is designed to discourage anti-social behaviour by preventing people from sitting on the bin or leaving rubbish on the top. Ashtray - The ashtray option gives smokers somewhere to correctly dispose of cigarette ends.